The new ChillBuster® Vet Surgical System is a safe temperature controlled and stabilized source of warmth for pre-surgical, surgical and post-surgical care of animals. The system consists of a surgical warming blanket, warming cage mat and disposable covers to keep the surgical and recovery areas free of contamination. The ChillBuster® Vet system contains technology developed by ThermoGear into personal warming devices used by the US military forces based around the world. The idea of using Department of Defense cleared warming technology for the veterinary medical area was discussed nearly six years ago at a medical equipment trade show in Atlanta, Georgia. Dr. Tim Crowe, (DVM, DAVS, DAVECC, FCCM), a prominent and respected veterinary surgeon, visited the ThermoGear exhibit and realized the warming technology on exhibit could possibly be adapted to the veterinary field. Eventually, ThermoGear developed two prototype systems for Dr. Crowe. Following extensive analysis and testing, he began using the vet warming devices in his surgical practice. Dr. Crowe said, "After using the ChillBuster® Vet Surgical Blanket for more than a year, I have been very impressed with the results. The blanket has performed hands down better than any other vet warming device available. It is easy to use, warms rapidly and is extremely reliable. I can readily see why the ChillBuster® human warming blanket was selected by the U.S. Department of Defense for use by our combat forces." 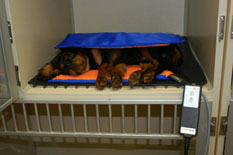 Yet another well-known veterinarian, Dr. Gary Norsworthy (DVM, DABVP) tested the prototype vet warming system. He said, "One of the major causes of surgical complications is hypothermia. Being able to control intra and post surgical temperature helps to insure a successful outcome. 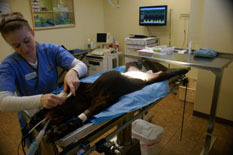 The ChillBuster® Vet system is an efficient and safe way to control our patient's body temperature. I now use the system routinely in my practice." Portable: The ChillBuster® Vet System does not require a bulky control box, only a small, hand-held controller which is easily hooked onto the surgery table or cage door. Clean: Non-permeable disposable covers keep the ChillBuster® blanket and cage mat contamination free and provide for easy cleanup. Both the blanket and cage mat are "hand" washable, "and air dry"! Safe: The vet warming system contains Department of Defense cleared technology for safe, stable and reliable patient warming. Power: Power: Power to the ChillBuster® Vet surgical blanket and cage mat is converted to Low Voltage Isolated Direct Current from line voltage AC, preventing accidental shock injury risk. The company's president, Mel Campf says, "Response to the new ChillBuster® Vet Warming System has been quite excellent. There is great interest from Europe, Asia as well as Canada. We are also seeing interest from animal cage manufacturers who would like to use our disposable covers for the cage mat to solve the major problems of post surgical warming and of keeping the cage areas free from contamination. Marketing and manufacturing the new system will be ramping up as the market becomes more aware of this new advancement in animal medical care." As to the future of the warming system, he added, "We would like to make this warming system a household name in veterinary medicine. We will also be adding improvements to make it possible to include all domestic animals, regardless of size, to be treated using our warming technology. Surgical Blanket Dimensions: 22" x 25"and 20" x 30"
Power Supply: Input, 110 to 240 AC 50/60 Hz; Output, Isolated, 12VDC. Controller: Simple one hand operation with only two push buttons and an LED Bar Graph display for easy selection from one of six heating levels. May hang from a surgical table or cage door by the integrated hook. Blanket and Cage Mat: Orange color denotes warm side as opposed to Blue side away from the patient. Blanket Flexibility: Surgical blanket can easily be wrapped around the patient. Disposable Cover: Non-permeable, easily disposed of for quick clean-up and non-contamination. The ChillBuster® Vet Warming System is assembled in the U.S.A.